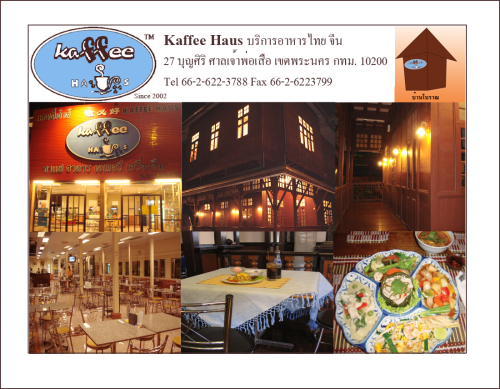 The Kaffee-haus Restaurant is a unique, upscale casual dining restaurant offering more than 100 menu selections including both Thai and Chinese cuisine. With beautiful antique houses restaurant locates in the middle of the Bangkok city, we are nearby many interesting places such as the Grand Palace, Wat Phra Kaew, the Royal Cremation Ground, Khao San road. Whether you are planning a banquet, anniversary, holiday party or any type of event, Kaffee-haus will accommodate your needs. Our warm ambience offers an inviting atmosphere for you and your very special guests. Our menus can be customized to suit your requirements and budget. For any questions you may have and where we are, please check our contact us page. All logos and trademarks in this site are property of their respective owner. The comments are property of their posters, all the rest © 2015 by Kaffee Haus Restaurant.